How did you become Canadian? Discover your roots – Get Free Access with Ancestry Canada Day! Spread a little holiday cheer! Save 20% on Ancestry gift memberships from $64.99. This is a one-time, non-renewing membership. Gift memberships valid for new subscribers only and not for renewals for current subscriptions. Terms and Conditions apply. See merchant site for details. Christmas Sale! 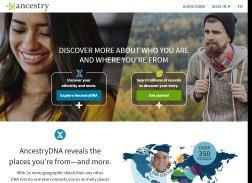 Get $40 Off AncestryDNA Test Only for $89.00, Was $129.00. CAD price includes taxes and excludes shipping. Terms apply.